During his first exchange with the press as a free man, the former head of Yukos Mikhail Khodorkovsky discussed his future after being released from prison. A commotion such as the one generated by the press conference held on Dec. 22 at the Museum of the Berlin Wall, right in front Checkpoint Charlie, can be rarely seen in the German capital. Hundreds of journalists gathered in a narrow room, calling for silence, jostling for a good viewing spot. 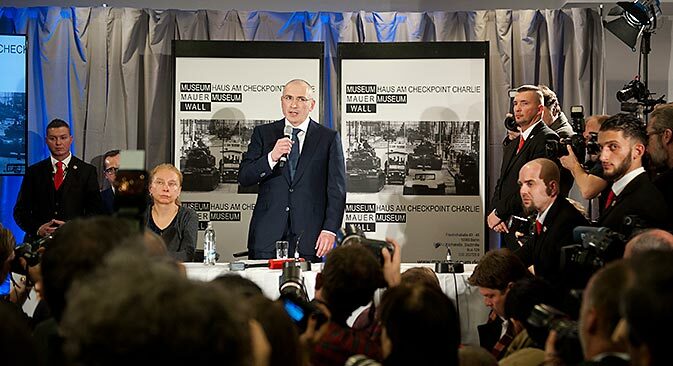 They traveled all the way to Berlin just to see and listen to the Kremlin opponent Mikhail Khodorkovsky, recently released from jail, in first public appearance after ten years of imprisonment. Just 36 hours earlier, the ex-prisoner had landed in Berlin on the private jet of the former German foreign minister Hans-Dietrich Genscher. It took two and a half years of negotiations with Russian president Vladimir Putin for him to be released. Khodorkovsky arrived at the venue dressed in a blue suit, a white shirt and a blue tie. With a hesitant smile, he replied cheerfully to the questions of the reporters. A little short of comments, he remained courteous throughout the presser. Are you planning to return to Russia? Are you going to get involved in the case for the release of Yulia Tymoshenko in Ukraine? I have ties with that area, because some of my family lives there. Yet, I do not have enough evidence to give an opinion on the current situation. Nevertheless, I hope that Yulia Tymoshenko will soon be released. At this point in time, president Yanukovych should follow Vladimir Putin’s example, and release her. What are your plans? Would you like to be an entrepreneur once again? No. I want to look into the plight of political prisoners in Russia. I also want to contribute to the development of civil society to make life easier in Russia. I need more time to think about my future. Do you have enough money to support yourself? Are you thinking about getting involved in politics? No. I am going to stay away from power struggles. I want to deal with social issues. I have not yet had time to think about this issue more closely. Are you going to give financial support to the Russian opposition? No. I am not going to provide any financial support to opponents of the president. I wrote to Putin telling him that I did not have any intentions of getting involved in politics, or regain my shares in the Yukos oil trust. How long can you stay in Germany? My visa is valid for one year. What was the real reason for your imprisonment? I am not sure myself. I do not know at all. What is your relationship with Putin? My family has never been in danger. This helped me not to get too overcome with emotion in this confrontation. Why have you filed a petition for clemency? What happened is a direct result of an order from president Putin. The pardon was a mere formality. However, admitting I was guilty would have been a different matter. I could not do such a thing to my former colleagues. This is the only reason I refused to apply for amnesty before, because it implied that I would have to plead guilty. After 40 minutes answering questions, the former oil billionaire went on to express his gratitude for the support received, thanking Genscher and the German chancellor Angela Merkel profusely. He also thanked all those who campaigned tirelessly for his release. Mikhail Khodorkovsky was born on June 26, 1963 in Moscow, Russia. His parents were Jewish workers. After studying chemistry and macro-economics, in 1987 he started producing Russian nest dolls with the image of Gorbachev. In 1989, he founded Menatep, the first private bank in Russia. In 1995, the bank was responsible for selling the majority of shares in the Yukos oil company. Khodorkovsky paid 255 million euros for a group worth 730 million ($ 1 billion). In 2001, Mikhail Khodorkovsky created the "Open Russia" foundation which was acting as an NGO for freedom and democracy. On October 25, 2003, the Russian special forces stormed Khodorkovsky’s private jet when it stopped in Novosibirsk for refueling. The billionaire was arrested. He was accused of tax evasion, theft and fraud. The verdict came out two years later: 9 years of imprisonment. The subsequent judgment expanded his sentence to 13 years and six months of detention in a penal colony. His book "A Prisoner of Putin" was published in 2012. Mikhail Khodorkovsky has been married twice and has four children.